Sandhopper Motorized Beach Wagon 30" x 48"
Sandhopper Motorized Beach Wagon 30" x 54"
Sandhopper Motorized Beach Wagon 30" x 60"
Sandhopper Motorized Beach Wagon 34" x 48"
Sandhopper Motorized Beach Wagon 34" x 60"
Sandhopper Motorized Beach Wagon 34" x 72"
Sandhopper Motorized Beach Wagon 38" x 72"
Everyone loves spending the day at the beach. From the refreshing salt air and breezes to relaxing by the ocean on the sand, it’s a great day at for anyone. What isn’t fun about beach trips is struggling with all of your snacks, drinks, blankets, and everything else you happened to bring with you. Beach tote bags take on more weight than what they were intended for. As a result, how often has a bag snapped halfway from the car? Rolling coolers are fine until they hit the sand; then it can be a real hassle to move. The easiest solution to all of your beach supply needs is a top quality electric beach wagon. Electric beach wagons combine the ease of a hand truck with a light motor to make traveling through beach sand a breeze! When others still rely on classic red wagons on heavy coolers, our electric beach carts do the grunt work for you. With a battery-powered motor, low pressure tires, and a steering handle complete with controls, all you have to do is keep it on track. As long as it can safely fit onto the cart, our motorized beach carts will run it all to your perfect beach spot. Our heavy-duty electric carts can lift up to 750 pounds! Best of all, on a fully charged battery our carts will really go the distance – as far as four miles at a time. This gives you the peace of mind of not having to worry about dragging it through sand yourself, and can even allow you to take multiple trips back and forth from the blanket to the car. If you have small children in your family, our selection of electric beach carts is the ideal choice. Even though they are motorized, the carts remain at a slow speed, maxing out at four miles per hour. This means never having to worry about sacrificing safety over efficiency. It can even help assist special needs families who may have extra belongings that they may need to bring with them. No matter what you and your family need to take to the beach, you’re in great hands with our carts. Electric carts can also assist elderly beach guests or those with difficulty walking through sand with giving them something to grip as it slowly makes its way through the tough terrain. By keeping it slow yet steady, your electric cart can help you maneuver through soft sand or harsh rocky beaches easier than before. If your favorite beach is notorious for steeper hills or sand dunes, they can even be outfitted with better terrain-gripping teeth. While it does sacrifice a little bit of speed, you’ll love how easily it makes its way through even the toughest sand conditions. Traditional beach accessories, such as wagons and hand carts, leave a lot to be desired. The further they are pushed, the easier it becomes to have them become bogged down in sand. More often than not, loose items bounce out as you wrestle with the handle, or worse, the entire thing flips over onto its side! Rolling coolers and other bulky plastic contraptions seem ideal, but more often than not they lack the sort of room you actually need to transport more than water bottles and sodas. Everyone tries to simply stack their beach blankets and other items on top, which quickly fall off while trying to navigate the terrain. The end result is dirty, sandy, or even wet books, toys, magazines, and towels. The only other alternative is to make multiple trips and carry everything by hand, or to use a great quality motorized electric beach cart. Rather than struggle with your large, heavy beach chairs and coolers, an electric beach cart does all the work for you while you merely tell it which way to go. Compact, easy to use, and long-lasting, electric beach carts are ideal for all your trips. If you’re ready to stop struggling with your belongings and start enjoying the beach that much quicker, then our line of electric beach carts are perfect for you. With customizable options, such as color, wheels, and terrain teeth, our carts are a great beach trip investment. 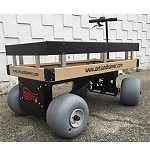 Buy your electric beach wagon today, on sale with free shipping at Handtrucks2go.com!